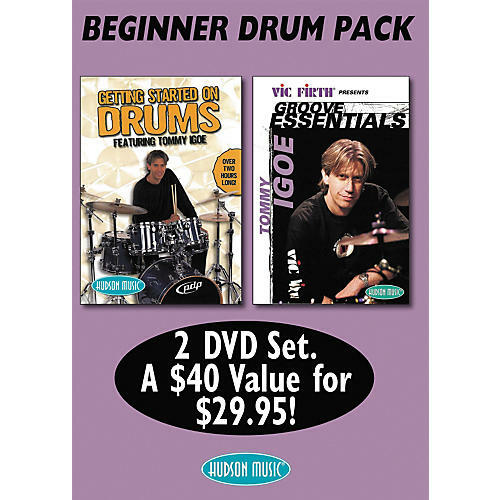 This money-saving 2 pack includes the complete Getting Started on Drums and Groove Essentials. With 6 hours of world-class instruction in all, this package is a great deal! Tommy Igoe brings his 25 years of teaching and playing experience to bear, creating the first DVD for beginner drummers! He takes you on a journey that starts with taking a brand new drum set out of the box and gets you started making music right away. Setting Up Your Drums! (Part 1) is dedicated to understanding your new drums. All of your drums and hardware, along with Tommy's unique "Power Square" concept, are covered in detail. Special DVD features allow you to select Tommy playing each of the grooves super slowly so you can really take your time to work everything out. Play-along versions of each one are included, so that you can start jamming and making music right away! Three-and-a-half hours of great material! Groove Essentials is based on the definitive collection of contemporary rock, jazz, R&B, funk, and world/ethnic drumming styles contained in the poster of the same name, developed by world-class drummer, teacher and author Tommy Igoe and Vic Firth drum sticks. On this DVD, Tommy demonstrates 47 of today's most popular drum patterns, including a performance of each with a rhythm track played by some of New York's top players. This unique feature lets the student hear what each groove sounds and feels like with real music played by live musicians. Included among the drum patterns are 8th-note, 16th-note, and half-time rock; jazz waltz, shuffle and swing, R&B, hip-hop and funk as well as world music styles, including New Orleans second-line, reggae, Bossa Nova, Samba, Mambo, Cha-Cha, Bolero and Tango. As a special bonus, the package includes a free Groove Essentials poster (courtesy of Vic Firth drum sticks), which contains fully-notated examples of every one of the 47 grooves on the DVD!